Maurice Sendak, children’s book illustrator best known for his book Where the Wild Things Are, grew up in Brooklyn as the son of Jewish immigrants from Poland. Confined by ill health during his childhood, he spent time drawing and, after watching Walt Disney’s Fantasia, he decided to become an illustrator. He studied at the Art Students League and took a part-time job at All-American Comics while in high school. He was commissioned in the early 1940s to create displays for the F.A.O. Swartz, and there met Ursula Nordstrom, director of Harper's Department of Books for Boys and Girls, who assisted him in breaking into his first jobs illustrating children’s books. His first project was Atomics for the Millions by Dr. Maxwell Leigh Eidinoff in 1947. He illustrated books by many authors during the 1950s including prolific children’s author Ruth Krauss and creator of the Little Bear series Else Holmelund Minarik. In 1956, Kenny’s Window, the first children’s book he both wrote and illustrated was published. This was followed in 1963 by his acclaimed and ground-breaking Where the Wild Things Are, about young Max, whose antics get his “sent to bed without any supper” and into a land where he cavorts with and becomes king of monsters unlike any other characters in children’s literature at the time. Where the Wild things are received the Caldecott Medal and multiple other awards. He saw it, he loved it, he ate it. "A little boy sent me a charming card with a little drawing on it. I loved it. I answer all my children's letters – sometimes very hastily – but this one I lingered over. I sent him a card and I drew a picture of a Wild Thing on it. I wrote, 'Dear Jim: I loved your card.' Then I got a letter back from his mother and she said: 'Jim loved your card so much he ate it.' That to me was one of the highest compliments I've ever received. He didn't care that it was an original Maurice Sendak drawing or anything. He saw it, he loved it, he ate it." Maurice Sendak illustrated more than 80 books in his careers, many of which he also authored, and was involved in the early stages of the Children’s Television Network during the development of the Sesame Street series. He illustrated multiple films and television shows and created sets for several operas. In addition, he collaborated with Carole Kings for a musical Really Rosie. 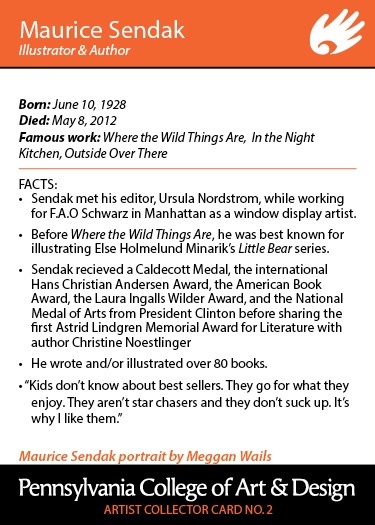 In addition to the Caldecott Medal, during his career Sendak also received the Hans Christian Andersen Award for children's book illustration, National Book Award in category Picture Books, Laura Ingalls Wilder Medal for American children's literature, National Medal of Arts, Astrid Lindgren Memorial Award for children's literature, 200 and was Inducted into the New York Writers Hall of Fame. He will be remembered for his contributions to children’s literature. 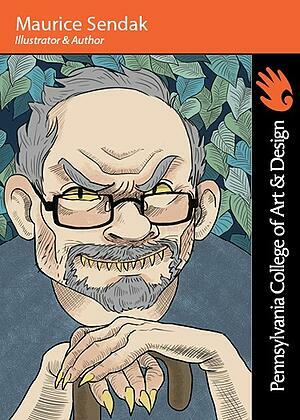 Portrait of Maurice Sendak by Meggan Wails.